It's football not soccer, and if you don't agree that Football Rules, then prepare for a riot. Click here to play! Be like the top football players in the world and make incredible amounts of money while seemingly doing very little. It's set to be a long season, so you'd better learn how to use auto spin to good effect. Every goal you score will bring you big prize money as you line up footballs, jerseys, goalies and even red card bearing referees to win. Throw some wild fans into the mix, and even more rewarding prizes can be forthcoming, and if you hit a whole line of wild fans, you'll feel like you've won the FA Cup. If you end up getting a bonus trophy symbol in reels 1 and 5, be prepared to go to a shootout. Choose your lucky ball to wind up for a number of free spins, then shoot the ball at the right angle to get the biggest bonus multiplier and make the goalie pay. Smaller victories can also be made even sweeter when played in the right stadium, which is why stadium scatter symbols are extremely good luck. A new season is always about to start in Football Rules! Now is the perfect time to find out what it's like to score a game winning GOAAAAAL! Stadium symbols multiply the total bet and add it to payline wins. 3 symbols means a 5 times payout. 4 mean 10 times. 5 mean a 50 times payout on the total bet. A wild fan symbol can substitute as anything other than a scatter symbol or a bonus symbol. Also, some payouts for multiple wild symbols are quite high. 2 symbols in a line can win 10 times the payline bet. 3 can win 100 times, 4 can win 1000 times and 5 wild symbols can win 10000 the payline bet. If bonus symbols of a man holding a trophy appear in reel 1 and 5, the bonus game begins. 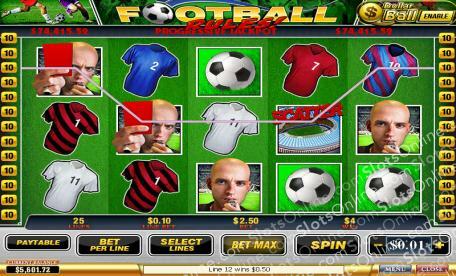 Players choose a lucky ball to determine the number of free spins they get, then choose a direction to shoot for the goal in to determine the win multiplier. The free spins are then performed automatically.